Thank you for visiting our web site and for noticing our new name, SPC Display Group, which more accurately reflects the continued evolution in staff size, sales, product offerings and capabilities that have been on-going since our founding in 1960. Please visit us at Booth #4627. Learn more. SPC Display Group has been providing Service, Performance and Commitment to retailers and brand marketers throughout the U.S., Mexico and Canada since 1960. 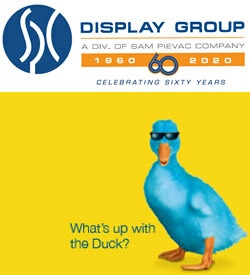 Until recently known as the Sam Pievac Company (SPC), SPC Display Group offers an outstanding value for in-house design, and domestic and import manufacturing of standard and custom metal, wire and MDF store fixtures and plastic displays, POS and POP displays, hanger management systems, sign holders, plastic shopping baskets, peg hooks, wire shelving, gondola accessories, OEM component parts and much more. We will deliver what you need, when you need it, at a price you can appreciate. And you can trust you'll have consistency across the line, whether you have a short run or a high-volume rollout. Our philosophy is "if you don't see it, ask for it." We'll make it for you fast, and economically – and that's a promise, straight from our famous blue duck, Shades.